Trifecta! A Pacific oyster, a blood oyster (see earlier post), and a kumamoto. 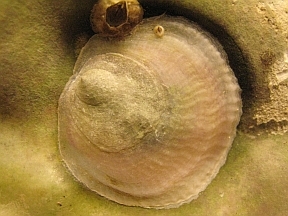 Like the Pacific, the kumamoto oyster (Crassostrea sikamea) originally hails from Japan. Some people think the kumo is a variety of Pacific (Crassostrea gigas) that evolved in isolated bays and estuaries. Kumos can't reproduce in Puget Sound or Hood Canal because the water is too cold, so the only way to grow them in these climes is to buy seed from an oyster hatchery. In the late 60s, when oyster aquaculture was in its infancy, scientists tried to create an oyster that would grow as fast as a Pacific but retain the deep cup and small size of a kumo. But according to this excellent San Francisco Gate article, the resulting hybrid oyster, called a "gigamoto," was a disastrous watery blob. Unfortunately, the gigamoto oysters infiltrated the kumamoto broodstock, so for the next couple of decades nobody in the Pacific Northwest could find pure Kumo seed. Researchers and oyster farmers had to go back to Japan to get unadulterated broodstock to use in their hatcheries. 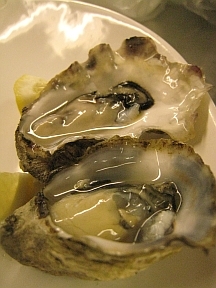 The near oyster is a kumo that spent the past two months on the HH delta; the far oyster is a Hama Hama Pacific. Hama Hamas are a very slow growing Pacific, and, at certain times of year, they have a flavor very reminiscent of a kumo. These two oysters, at any rate, were both deliciously sweet and clean tasting, and we'd pit our Hama Hama against a kumo any day. But we're not exactly impartial. 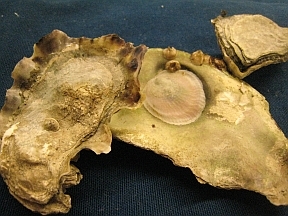 And we include the blood oyster in the post simply because he's beautiful.